As shown in the diagram above, a 20N force acts on a 4cm² surface. The force is shared equally by the surface, hence each 1 cm² of the surface withstand a force of 5N (20N/4). 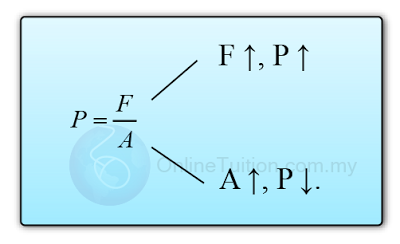 The force (5N) acts on 1 unit area (1cm²) is said to be the pressure acting on the surface. 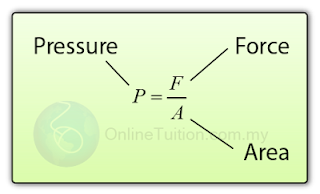 Therefore, the pressure acting on the surface is 5N/cm². The SI unit of pressure is Pascal (Pa). 1 Pa is equal to1 newton per metre2 (N/m²). 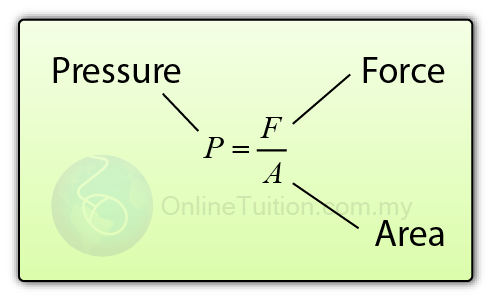 Factors that affect the pressure acting on a surface. The larger the force, the higher the pressure. The larger the contact area, the lower the pressure.